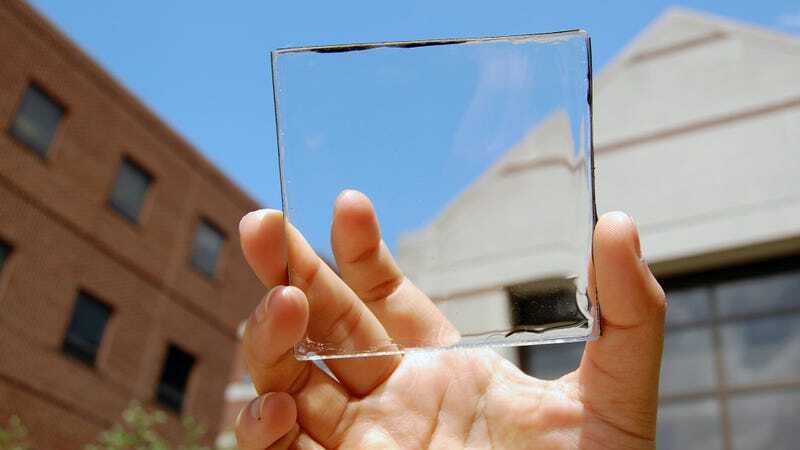 The idea of a completely transparent solar panel has always been a bit of a dream. Such revolutionary technology would mean that we could turn windows into power generators and build phones with self-charging screens. Well, guess what? That dream is becoming a reality. A team of researchers from Michigan State University has developed a completely transparent, luminescent solar concentrator. Whereas most traditional solar panels collect light energy from the sun using dark silicon cells and converted into electricity using the photovoltaic effect, solar concentrators actually focus sunlight onto a heat engine that produces electricity. In the case of this new technology, the plastic-like material channels specific wavelengths of sunlight towards the photovoltaic solar cells on the edge of the panel. "Because the materials do not absorb or emit light in the visible spectrum, they look exceptionally transparent to the human eye," Richard Lunt, who led the research, explains in a release. Scientists have created partially transparent solar cells in the past, but the existence of crystal clear cells opens up some very exciting new possibilities. "It can be used on tall buildings with lots of windows or any kind of mobile device that demands high aesthetic quality like a phone or e-reader," says Lunt. "Ultimately we want to make solar harvesting surfaces that you do not even know are there."